(Liquid Dispersions Coatings) G-COATTM (Polyether Ketone) Emulsion Series liquid dispersions are available where thinner coatings are required, where difficult geometries must be coated, and in instances where enhanced properties such as release are required. 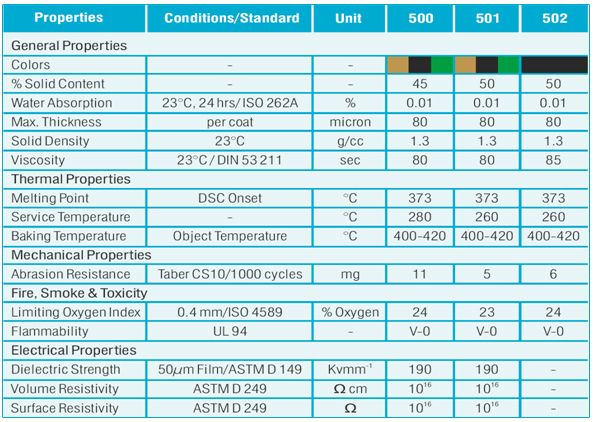 G-COATTM 500 A pure G-COATTM dispersion with typical properties being very high continuous use temperature of 280°C (550°F), excellent wear, abrasion with very good chemical and excellent radiation resistance. Available in natural color, green & black. G-COATTM 501LT These grades have been specifically formulated to provide a high wear and abrasion resistance coating with excellent non-stick properties.